In a collection exclusive to Selfridges, a collective of designers have come together to collaborate on Bello Yellow. Inspired by and featuring the minions themselves, the collection is every bit as fun as you’d expect, and yes, there are even dungarees. From the Rupert Sanderson on point Minion courts to the cute Piers Atkinson headbands, this is a collection which will please Street Stylers and Bloggers (myself included, natch) aplenty. With urban cool designers Criminal Damage and Steve J & Yoni P on board, the collection is sure to appeal to da yoof. There’s a cool range of sweaters and sweatpants with a minion motif, as well as some super cute leggings with a matching cropped top (yes, I already own these). Criminal damage did a similar collaboration with Peanuts recently which was a huge success and with everyone going Minion Mad, there’s no doubt this one is sure to be too. Steve J & Yoni P have kept things simple and concentrated on denim, including two pairs of Minions inspired dungarees, and fun slogan tees which will doubtless appeal to the masses. In a nod to the storyline of the Minions movie set in sixties New York and ultimately, London, Giles Deacon has created a six piece mini collection for Bello Yellow including minidresses and tee’s which are actually, pretty damn cool. 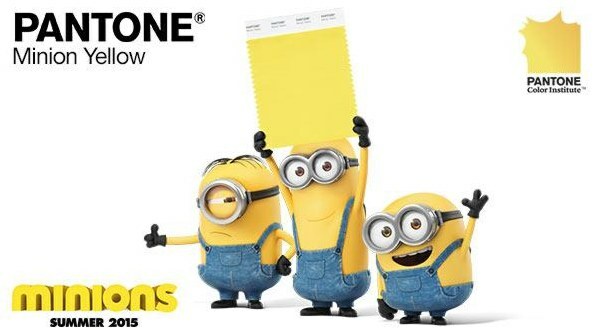 Using a monochrome palette and official Minion Yellow (obvs.) it’s a pretty wearable collection that will be all over the streets of London (for the next month or so at least). Cult jewellery designers Tatty Devine are on board for the project and it’s right up their street with their quirky laser cut pieces taking centre stage. From their iconic T-Rex bones necklace to a simple keychain, there’s something for Minion lovers everywhere and before you jump in and criticise, remember, it’s just for fun, it’s not like anyone’s plotting to take over the world or anything….. Pretty cute! I’m sure these will be a massive hit with da yoof!